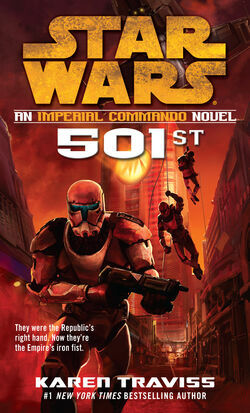 Imperial Commando: 501st will the be the first novel out of a series (maybe a trilogy?) due in October, 2009. Thoughts? Hopes? Guesses? Critics? Got nuts! It has a complete listing of all the books due out in 2009 and some for 2010. From what I saw in the article Imperial Commando is supposed to have a second book in July 2010 so you may be right, Daennika, on the trilogy! Great title, huh? Clone troopers become stormtroopers in this gripping aftermath of Order 66. Follow Darman, Niner, and other favorites as they find their way in the new Empire gone mad. Finally, thanks Daennika for giving a preview of the cover art. Very nice. Alseides, Sev's fate is actually the property of LucasArts and my theory is that unless we get a second Republic Commando game (oh how awesome would that be? I would crap my pants) Sev's fate will remain a mystery. I sense a Sarlaac-food type of pattern here. Remember how long we waited until Lucas gave his "OK" to revive Boba Fett? That was some kind of crazy. I'd also love to see some Jedi Kaminoan action. Eek, spoilers But screw it, let's assume you guys all finished reading Order 66, kaykay? If none of that happens well I'll just have to include it in my own RepCom sequel stories. Well you have a point there Daennika, about Sev's fate. Im really optimist about a new Republic/Imperial Commando game, since in the new Game "Force Unleashed" on of the easter eggs was a RepCom Helmet, so I really feel that a new game is waiting... or at least I hope so. And for the Imperial Commando... I agree with you, but also I want to see some Revenge from Ordo, I mean, in the book, Omega and Skirata saw how a Jedi Killed Etain, so He feel that he will take some revenge. Also thinking about that, the part when Niner felt down... I don't know, it remains me alot fo "Black Hawk Down", I don't know why. Also, a good Bounty Hunter Novel between Mandalorians and the Empire ones, would be amazing, and your idea is really good Daennika, since the Empire wants to build an outpost on Mandalore. Dig the cover; can't wait for the book. Shall I bring to the general attention that, in the above posted cover art, there are absolutely no signs of those Commandos actually working for the Galactic Empire? I think it's pretty safe to assume the ones depicted on the cover are in fact working for the Empire. Ah I see. Speaking of cover art a question has popped into my head. Whatever happened to that sweet Order 66 cover art? The one of the extreme close-up of the visor with the temple burning in the background? Does anyone know a reason (besides the choice for hardcover) that they went for the odd cartoonish one? Guess it's the early Empire, so they're not going to be changeing to a Stormie-commando suit for a while. Either way, Karen Traviss hasn't let me down yet as a reader, and I hope this book just builds on the excitement that I've felt in the last few books. If I relied on my local book retailers I would quite frankly not be here. Try amazon.com, I use amazon.fr (I'm living in France) and I get free shipping for books in English which is most, most good. It takes a couple of days so that's really cool too. By the way you need a credit card to pay online, ask your mommy or your daddy if you don't have one. Amazon is pretty safe, I can tell you that. OR, search illegal scans of the book in the piratey sites. That is, if you can bear reading 500 pages on a computer screen. I bet that Bard'ika is going to end up on Kuat with Kad, and Kal will be the one who suggests it/takes them there/stays with them there. I remember reading on Ms. Traviss' website that the image was too similar to the hard-cover book The Clone Wars(based on the newer, 3D animated show) released at around the same time. I'll try to get a solid reference for you, but no promises because it's a lot of information to sift through. I'm somewhat certain that I'm right however, as I distinctly remember being irritated at the choice switch. As for my expectations of Imperial Commando... I hope we get to see some actual commando action, like back in Hard Contact and Triple Zero. Not to bash on True Colors and Order 66 (because I loved them as well), but the most recent two felt a little lacking in the commando-esque action. By Jove, let's seem some soldiering action! I can't wait for 501st. I just finished rereading the first four books in the series. Speaking of which, does anyone know when the paperback of Order 66 comes out? I'm currently borrowing a friend's copy. I cannot bear to wait much longer i want to know what happens next with Niner and Darman...argghh but then if it was done to quickly it might not end up so good so all I know is that it's gonna be well worth the wait. I too can't wait for this to come out! Hopefully it will live up to all our hopes and dreams! Haha Daennika.....I use amazon as well. Best prices ever, and fast shipping. I have Prime. Can't wait till it comes out, though I'm sad that there's only gonna be two books in the series.....love the mercs fighting Mandos idea. And I can't wait to see what happens to Niner and Dar....Can't wait! I was able to order this today (october 28th) on Amazon so you guys better check your retail stores! I ordered it on the 27th, so hopefully it'll come on the 29th (tomorrow). I'll try to read it fast and then get a review or synopsis or something up. remember to warn about spoilers!